WALNUT CREEK, CA--(Marketwired - December 08, 2016) - Community leaders and supporters celebrated Oma Village as a model for affordable housing, when the Grand Opening Party attracted more than 300 people to applaud this new program for 14 homeless families. "Every one of these 14 units is going to be transformative for a family as they turn their lives around," Congressman Jared Huffman told guests at the event. "We've got a critical need for more." Guests enjoyed music and toured the furnished units, which will begin welcoming families before the end of the year. 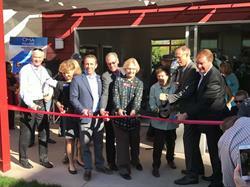 Others who helped cut the red ribbon included state Assemblyman Marc Levine, Novato Mayor Pat Eklund and Dr. Thomas Peters of Marin Community Foundation. Homeward Bound of Marin will operate Oma Village providing a continuum of care for homeless families. Through HomeAid, skills and materials from manufacturers and building professionals are pledged to Oma Village at a discount, enabling construction at the lowest possible cost. Oma Village cost an estimated $5.5 million to complete, with 90 percent of funds raised through grants and community contributions. HomeAid partners have assisted with everything from clearing the land of tree stumps to procuring kitchen faucets and planning the solar panels. The value of donations through HomeAid Northern California topped $1,300,000. "This is our first permanent supportive housing project, so we're very excited about providing housing for deserving families. Our builder captain partners Richmond American Homes and The New Home Company stepped in as Builder Captains to build Oma Village because they understand how important affordable housing is to families" says Cheryl O'Connor, HomeAid executive director. Homeward Bound of Marin collaborated previously with HomeAid in building the Next Key Center, which opened in 2008. HomeAid coordinated $250,000 in savings for that project, which includes 32 studio apartments, a training kitchen, The Key Room event venue and offices. "HomeAid is an amazing partner, not only enlisting the highest quality trades and industry professionals, but focusing on projects that have lasting value in the community," says Mary Kay Sweeney, Homeward Bound of Marin executive director. Oma Village will offer 14 one- and two-bedroom apartments, plus a community building with laundry and homework club, a playground and shared gardens. Homeward Bound, the county's chief provider of residential services for homeless families and individuals, purchased the site in 2012. The land formerly was occupied by a 30-bed drug and alcohol rehabilitation program for men. Oma Village moved forward with leading support from the Marin Community Foundation, County of Marin, City of Novato and the Dominican Sisters of San Rafael. Major grants also came from Tamalpais Pacific and the James Irvine Foundation. HomeAid Northern California would like to thank our Builder Captains Richmond American Homes and The New Home Company and all of our donors including Ace Insulation, Amerisink, B.E.E. Pest services, Baier Heating, Bryan Environmental, Cal West Carpentry, Cosco Fire Protection, Courage Safety, Cultivated Landscape , Delta Faucet, Fiber Care Baths, Gellert Foundation, Ghilottim, HD Supplym Hermsmeyer Painting, Herrick Drywall, High End Development, Homesite Services, Infinity Canopy, Iron Dog, Kelly Moore, Keystone Doors, Landmark, Lees Construction , Legacy Windows, MASCO, Maytag, Millhouse Glass A-1, Nordby Electric, Oldcastle Precast, Pacific Builders, Petersen Dean, Power Factor, Quality Built, Richard Wilkins Construction, Ross Recreation, RV Stitch, Shade Comforts, Shiloh Construction, Simpson Strong Tie, Sunpower, Swan Plumbing, The Welding Shop, Tile Redi, Timberlake Cabinets, Victory Fire, Waltex, YNR Construction. HomeAid Northern California has completed 39 shelter projects serving over 7,000 homeless through the construction of over $18 million worth of real estate for 16 homeless service providers and provided over $7 million in donations to these projects. 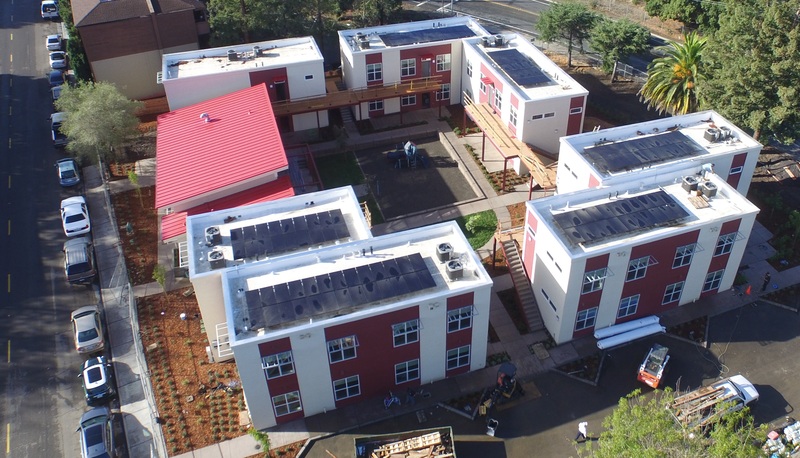 HomeAid's recent projects include the construction of Oma Village with Homeward Bound of Marin and the construction of a new Oakland site for DreamCatcher, Alameda County's only emergency shelter for homeless and sexually exploited minors. For more information about HomeAid, visit www.homeaidnc.org. HomeAid Northern California is one of 16 chapters of HomeAid America, a leading national non-profit provider of housing for homeless families and individuals, which has sheltered over 220,000 people in its 26 year history. For information on HomeAid America, visit www.homeaid.org. Homeward Bound of Marin is the primary provider of Marin County homeless shelters and services for homeless families and individuals in Marin, California. Homeward Bound of Marin operates the only emergency shelter for homeless families in Marin County, which is the entry point for our Family Services Program. Homeward Bound of Marin also operates four supportive housing programs for families, including Oma Village in Novato. With limited affordable housing options in Marin County, Homeward Bound of Marin has developed a variety of supportive housing. Families in these programs may continue to receive services like counseling, job training, job retention support, and credit repair or money management classes. To find out more or donate to Oma Village, please see www.hbofm.org.